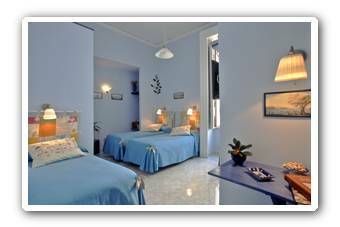 In the historical city centre of Naples, on the 3rd floor of an XVIIIth century building, where at the beginning of 20th century the famous Napolitan writer Matilde Serao lived, the traditional Napolitan hospitality links up with the modern attitude of reception typical of an English B&B. 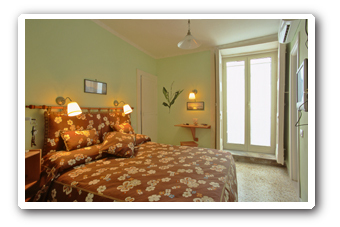 I Fiori di Napoli B&B is well connected with transport services like Cumana station, Cable cars, Underground stations, Circumvesuviana station, SITA bus stop, Naples railway station, Port Beverello Mole. 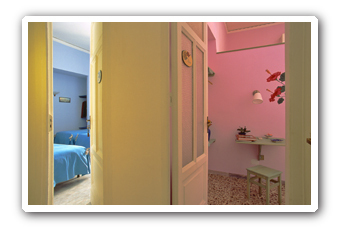 In a spacious and bright flat, entirely renovated and provided with heating system, I Fiori di Napoli B&B with its three bedrooms Roses, Wisteria and Sunflowers speaks about Naples, its colours and flavours without leaving out guests need for comfort, televisions in all rooms, a comfortable living room where breakfast is served, an internet access point, a little library with books on habits, manners, curiosities, legends, historical stories and fanciful tales about Naples and its famous personages. Moreover, a full time tourist help is also available in three languages, which makes it easier to get useful information on artistic and cultural events happening in Campania. 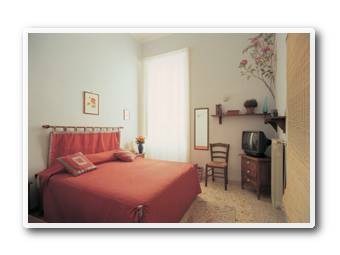 This service also includes the distribution of material provided by the City of Naples Tourist Board. 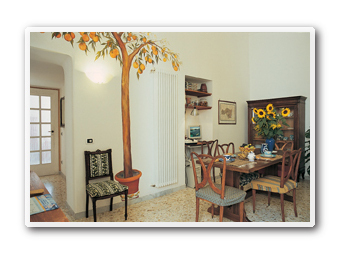 All these things make I Fiori di Napoli B&B an ideal place where to spend holiday. highway A1 (del Sole) exit A3 (Naples -Salerno connecting road). Follow the road signs to Naples city centre running along via Marina - Piazza Municipio - via Medina - via Monteoliveto - via S. Anna dei Lombardi - via Toledo until you see the La Rinascente department store sign-board. Turn on the right and go along via Concezione a Montecalvario via Francesco Girardi. in Piazza Garibaldi railway station take the Underground to Pozzuoli and get off at Montesanto stop. Go on along via Toledo, until you see the La Rinascente department store sign-board. Turn on the right and go along via Concezione a Montecalvario, via Francesco Girardi. At the bus stop in piazza Garibaldi take R2, get off in piazza Trieste e Trento and go along via Toledo until you see the La Rinascente department store sign-board. Turn on the left and go along via Concezione a Montecalvario via Francesco Girardi. take the bus Alibus or the 3S line bus and get off in Piazza Municipio. Go along via S. Giacomo - via Toledo until you see the La Rinascente department store sign-board. Turn on the left and go along via Concezione a Montecalvario via Francesco Girardi. from the port: Piazza Municipio - via S. Giacomo - via Toledo until you see the La Rinascente department store sign-board. Turn on the left and go along via Concezione a Montecalvario via Francesco Girardi. 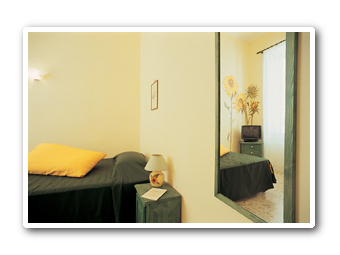 bar service, dinner*, room service, laundry service, showing of home video cassettes. Even in ancient Greece rose fleeting length suggested the transience of time while, on the contrary, it meant a hymn to life and its pleasures; it was also the symbol of reserve and literary speaking, the secret passion. Rose is the ambassadress of feeling either if given or received as a gift. It comes from the East, with its message of tenderness and mutual friendship. In ancient China to give a plant as a gift was the symbol of availability and true love. Its flowers contain a sweet substance which probably gave it the name of glikis the ancient Greek term for sweet. An ancient flower native of Peru, (fossils of sunflowers dating back to 3000 B. C. were discovered), where, according to the Inca civilization, it was the emblem of the Sun God. American Indians considered it as the symbol of happiness and pride, they used to dress up virgins heads with sunflowers because they were holy flowers. The Sunflower was also the symbol for Oscar Wildes aesthetic movement.